The following steps will show you how to set up Market Analyst to read	the	data	from	Premium	Data, DataTools or Premium Forex. Market Analyst now wants to know which folder tree to search. By default, the Premium Data database is stored under C:\Trading Data. Highlight that folder and then click OK.
Market Analyst will now scan the entire Trading Data folder tree and remember which folders contain MetaStock data. When Market Analyst is installed, there is a small amount of demo data provided by Market Analyst. This data is used in preference to the "MetaStock" format data provided by us, so you may see full history for some securities and limited data history (provided by Market Analyst) for other securities. 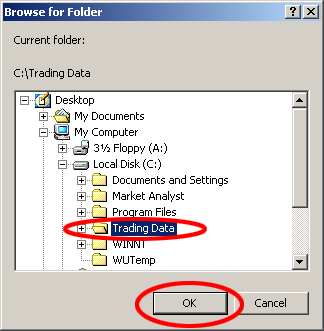 To prevent confusion over which data source is being used, it is recommended that you remove the Market Analyst data folders from being shown using the "Remove Folder" button (this is located next to the Add Folder button as shown above). 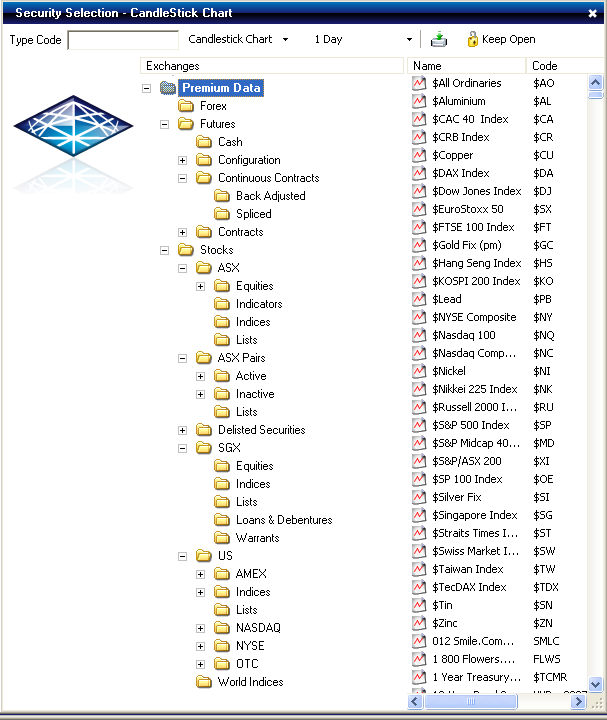 When a new data folder is created (such as when a new market is added to the futures data, or when you subscribe to additional data), it is not shown within the navigation folder tree within Market Analyst. 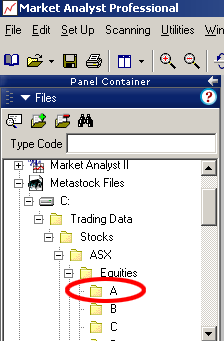 Market Analyst needs to be told to re-scan the Trading Data folder so it can add any new folders that it finds to its folder navigation tree. For Market Analyst versions 2 through 4.5, Follow the Add Folder steps as detailed above to complete this process. Market Analyst has a bug/limitation when data is reinstalled or when some types of data maintenance occurs. It doesn't automatically rescan any MetaStock format folders to determine the constituents. Market Analyst needs to be told to re-scan the Trading Data folder so it can re-index any folders. If you copy a workbook from one PC to another and notice that the charts now point at different stocks, this is due to a limitation in Market Analyst. 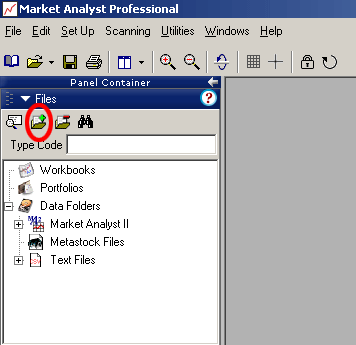 Market Analyst stores the reference to the stocks by the filename of the data files and not by the symbol. So, for example, on one computer file number 385 might be CBA but on another computer file number 385 is CAZ. The only way to resolve this is to make sure that the data on each computer is identical - so you need to copy both the Market Analyst workbook and the data. 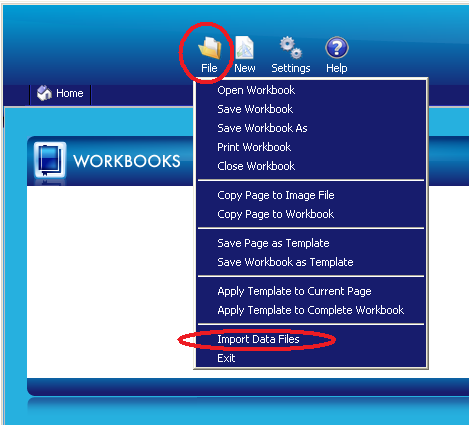 Some users have reported that if they reinstall the historical data that their workbooks are corrupted (showing the wrong securities etc.). This is due to a limitation within Market Analyst. Market Analyst stores the reference to the stocks by the filename of the data files and not by the symbol. So, for example, on one computer file number 385 might be CBA but on another computer file number 385 is CAZ. The only way to resolve this issue is to restore a known good backup of the data and update it from there, or recreate your workbooks. If you do need to reinstall the data, please rescan the the folder tree as shown above. 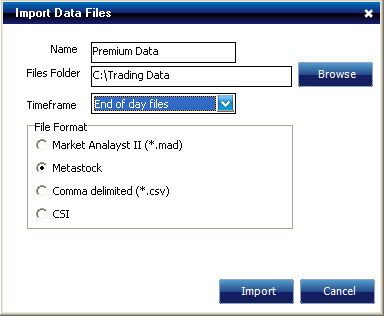 Premium Data allows stock data to be stored in a single folder Metastock format (6000 securities per folder). Although Market Analyst can support the 6000-securities-per-folder MetaStock format, its performance in a large folder is poor. For example, it can take up to 15 seconds to show the securities available in a large folder versus around half a second for an alphabetical folder. Therefore it is recommended that you use alphabetical folders for your stock data. Our historical data for the Dow Jones Industrial Average extends back to 1896. 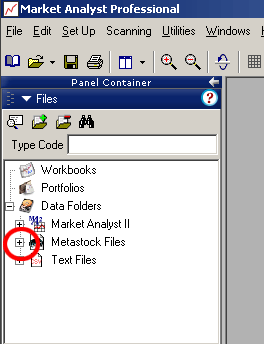 There is a bug with Market Analyst's handling of "Metastock" format data files which contain dates prior to 1900. For instance, data from 1896 is shown as belonging to 2006 and therefore the Dow appears to be at around a value of 90 instead of around 11000. To work around this problem, use the utility in the Premium Data application to "Remove Records Prior to 1920". This utility can be accessed from under the Maintenance tab. Market Analyst is a registered trade mark of Premier Software Group Pty Ltd.